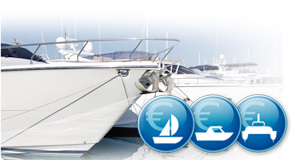 At Portmaps you have the possibility to sell your boat comfortably – with an item in the home-marina directly at the map. Chose "Sell boat" at the menu item "Boat market" an already you have the possibility to upload all relevant data and photos of your boat. Your boat-presentation will be shown at the map immediately and potential buyers can get in contact with you. A highlight is the possibility to download your boat-presentation as a PDF – ready to print out and show on an advertisement board.